Front End Layout: If Fixed (900px) option is checked, the front end will be displayed in the center and take 900px of screen width irrespective of screen resolution. On the other hand, if Fluid (100%) is checked then front end would cover the whole width of the screen. Home Page Theme: Knowledge base provides three themes based on how knowledge base home page will display category tree, news and articles heading. Choose the one as per your preference. Article Page Theme: Two themes are available for the orientation of article page. Themes are designed to arrange the article parts like article title, article contents, category Tree, headings, article options at different locations. Category Tree Width: This setting allows you to specify the percentage width that category tree will take in proportion to the whole width. You can select any value between 20% to 30% from the drop-down list. Category Columns: Select number of columns into which you want to arrange the knowledge base categories. Show Articles in Category Tree? : The title of articles of the category will appear in category tree if this setting is enabled. Category Articles Count: If Show option is chosen, it will display a count of total published articles available under the category. It is recommended to disable this setting for knowledge base having a huge number of articles. Sort Categories By? : If Alphabetic Order is checked, categories will be displayed according to their names arranged in alphabetic order. You can mark the Priority option to display categories according to the priority level assigned to them in manage categories. Display Featured Articles? : Enable this option if you want to display "Featured Articles" on the home page of the front end. Number of Articles - Enter the count of featured articles that you want to display. Display Most Popular Articles? : Enable this option if you want to display "Most Popular Articles" on the home page of the front end knowledge base. Number of Articles - Enter the number of most popular articles that you want to display. Display Recently Added Articles? : Enable this option if you want to display "Recently Added Articles" section on the home page of the front end. Number of Articles - Enter the number of recently added articles that you want to display. Display Top Rated Articles? : Enable this option if you want to display "Top Rated Articles" section on home page of the knowledge base. Number of Articles - Enter the number of top rated articles you want to display in this section. Enable Subscribe to KB? : If the option is marked as Yes, subscribe to Knowledge base section will be visible to KB users (end users) to subscribe to the knowledge base and to get notified when articles are added or edited. Sort Articles By: It displays three options by which articles can be sorted in the knowledge base. If Popularity is checked, the articles are sorted according to the article hits. If Alphabetic Order is checked, the articles are sorted according to the alphabetic order of their titles. If Update Date Time is checked, the articles are sorted according to the date they were last updated. 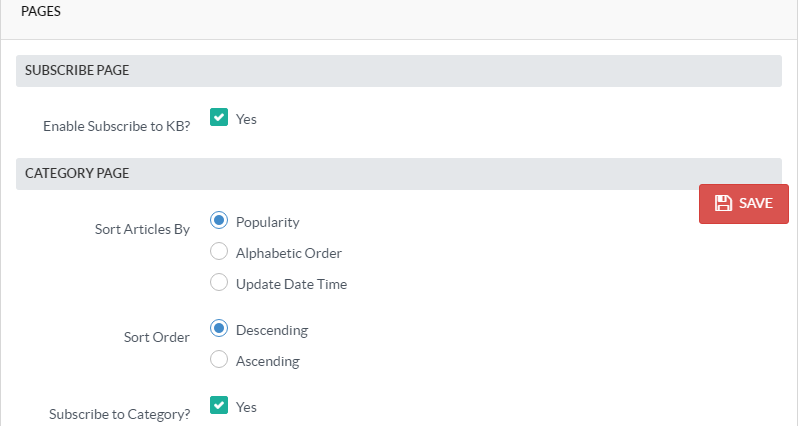 Sort Order: This option allows to specify the chronological order of ’Sort Articles By’ setting. You can either choose ascending or descending order according to your choice. Subscribe To Category? : If the option is marked as Yes, ’Subscribe’ link will be displayed with category title on the category page and users can subscribe to a category to get notified when new articles are posted under the category. Enable News Page? : If checked, it will display News link in knowledge base header and corresponding news page in the knowledge base. Display News On Home Page? : If checked, displays the recent news headlines on the home page of the knowledge base. Number of News - Enter the number of news headlines you want to display in the “News & Announcements” section on the home page of your knowledge base. Enable Login Page? : If a setting is marked as Yes, it will display Login link in knowledge base header and KB Member users will be able to login to the knowledge base and access private data. Enable Glossary Page: If the option is marked as Yes, Glossary link will be displayed in knowledge base header and allows KB users to access glossary page. Enable My Tickets Page? : If the option is marked as Yes, My Tickets link will be displayed in knowledge base header and allows KB users to access My tickets page. This option is available only in enterprise edition of PHPKB Software. Enable Contact Page? : If the option is marked as Yes, Ask a Question link will be displayed in the header of the knowledge base and allows KB users to post their questions. Send Notification? : If the option is marked as Yes, the software sends a ticket creation notification email to the email address specified by the user in Ask a Question page. Contact Email Address(es): Specify the email address of your organization on which contact page notifications will be sent and which will be used as the default “From” address in outgoing emails. Instant Suggestions? : If it is enabled, articles relevant to user query would be displayed to users while they type the content in ’Ask A Question’ page. 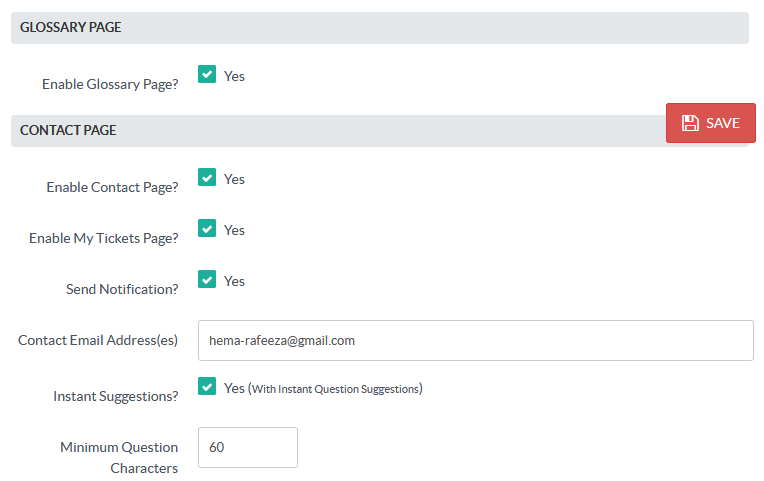 Minimum Question Characters: It allows you to set the minimum number of characters user should type in a content field of ’Ask A Question’ page. The user would be compelled to write at least characters specified in this setting. Default Search: Select one option among articles, news or categories so that it can be set as the default option in Search for field of the advanced search page. Search In: Select one option among all, title, content or keywords so that it can be set as the default option in Search In field of the advanced search page. Recently Viewed Articles? : Enable it to display a list of Recently Viewed Articles below the category tree in the knowledge base. Enter the count of the number of recently viewed articles to be displayed in Number of Articles setting. Click on "Save Changes" button to save the modifications you have made or you can click on "Cancel" button to abandon the changes.